Home / Is It Time to Embrace the Red Maple? Is It Time to Embrace the Red Maple? As sap collectors and syrup producers, the time has come to plan for and embrace the red maple tree in our endeavors. The species is becoming more and more prolific in our forests and this trend has been noticed over the last 100 years. How do we adjust? The red maple is also known as the swamp, water, or soft maple. The US Forest Service lists it as the most abundant native tree in Eastern North America. It can be found from Minnesota to Maine and then south to Florida and west to Texas. The red maple is so adaptable that it flourishes in both country and city; in swamps and mountains. It is this flexibility that is part of the reason for its popularity. Since it seems to grow in any soil, in any light, and in a variety of climates, the tree is a favorite of landscapers. The rapid growth and desirable shape with the deep scarlet color in Autumn makes it a favorite for our yards and city streets. It does not hurt that the tree is so very tolerant of pollution and road salt either! The only event that a red maple cannot endure is fire. Since we have become very good at fire suppression, this natural “cleaner” has not kept the red maple population in check. This popularity has lead to a situation where the red maple could almost be considered invasive as the red maple gains influence. The red maple is one of the first trees to flower in the Spring and the first to drop seeds every year. These seeds also sprout within a few weeks in just about any environmental condition. A sapling will also easily sprout from a stump. The rapid growth brings shade where other hardwood saplings need sun. And the growth happens easily in disturbed land – cleared areas or abandoned fields – and through environmental changes. How do we identify these trees? It can be a challenge because of the great number of maple species and associated hybrids. Reliable identifiers are leaf shape and bark. 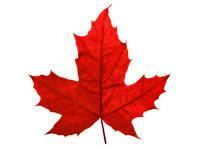 The red maple leaf is usually 2″–4″ long with 3–5 lobes that have rough and saw-like edges. The trunk of a red maple tree is typically free from branches. When the tree is young, the bark is smooth and a pale gray. As the tree ages, the bark will show straight cracks and be a dark brown. Since we can now identify the red maple, a plan can be put in place to best manage those trees. Management can be done by fostering diversity and keeping your red maple numbers in check. Identification can also aide a syrup producer to know when to pull those taps or set up a separate collection line for the sap from the red maple. The sugaring season for a red maple may be shorter but the syrup is just as sweet and the sap is just as plentiful. Some maple producers may claim that the sugar content in red maple sap is lower than that of the sugar maple but records show that that is not necessarily the case. Sugar density seems to vary from tree to tree. What do you think about the changing makeup of our forests? Will you reduce your Red Maple population or will you embrace it? Join the conversation by commenting below or join us at Facebook.com/smokylakemaple. “Eastern Forests Change Color As Red Maples Proliferate.” New York Times. Retrieved 30 March, 2015. Nix, Steve. “Ten Most Common Trees in the United States.” About.com Forestry. Retrieved 8 October, 2016. Abrams, M.D. (1998). “The Red Maple Paradox: what explains the widespread expansion of red maple in eastern forests?”. BioScience. 48 (5): 355–364. doi:10.2307/1313374. “Plants Profile for Acer Rubrum.” United States Department of Agriculture. Retrieved 30 March, 2015.